Serving Trays - Decorate and Conquer! Trays went out of fashion for a while. I don't mean rich wooden trays or square TV serving trays that get used everyday. I mean the heavy silver trays that tarnish and make you look like a bad housekeeper... I inherited a few of these silver serving trays recently. I was planning on giving them away, thinking no-one would want to buy them. Putting serving trays together on a wall can look really chic. Whether they are the same size or shape, in a row or placed symmetrically, you can get a great look using trays to decorate your wall. You can use them to highlight your wall color or let them blend into your color scheme. 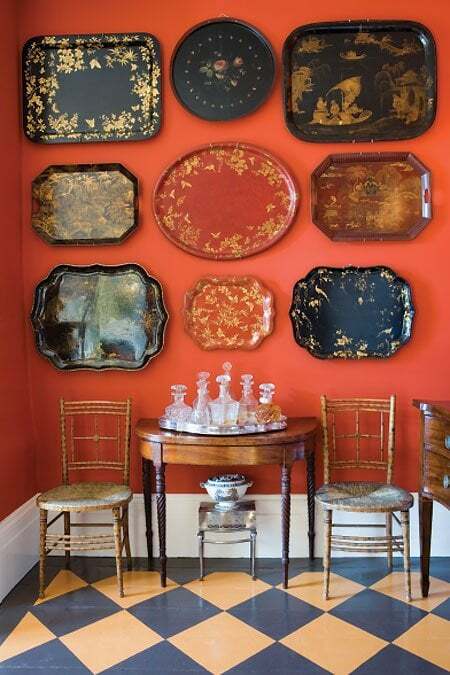 Beautifully painted trays on a wall look more like art, particularly if they match your wall color scheme. 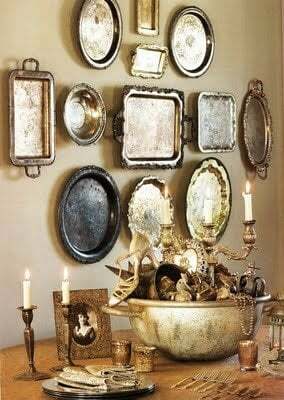 Using them as wall decor is also a great way to protect vintage or antique serving trays - as long as you make certain each tray is secure. Don't you love this? 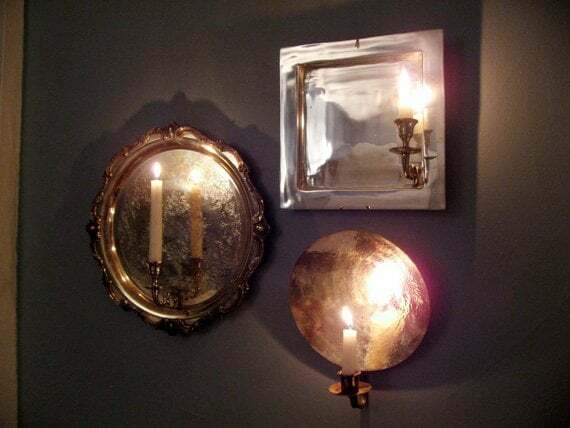 I love wall scones and beautiful french sconces are quite expensive but using silver trays like this means you get the look without the cost. Candlelight is flattering to almost every wall color scheme. 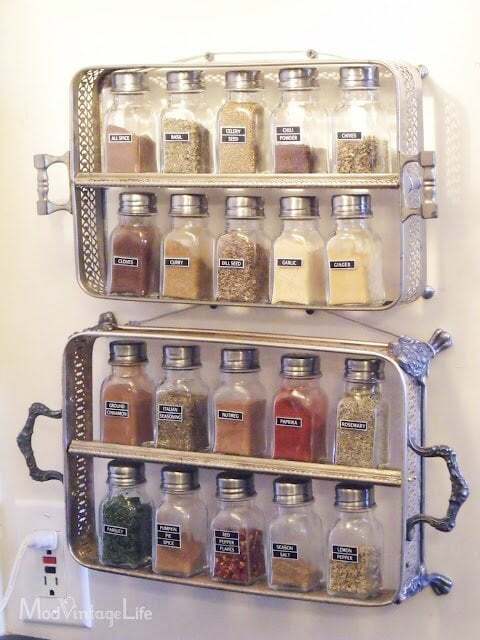 I was surprised to see silver casserole trays converted to shelving.. and it looks great! What about using chalkboard paint on silver trays? You've probably seen them in restaurants displaying menus, 'wait here' messages and in homes with reminders. Great idea.. and go with every color scheme. You can use your trays to organize your kitchen, bathroom, bedroom, dining table or office. Serving trays are a great way of keeping things together so you don't have to continually hunt for them. There's a lovely symmetry from placing items like soldiers within the confines of a beautiful tray. They are also great for table settings. For more ideas read this great article from Shelterness.com - 17 Cool Ideas To Decorate Your Home with Metal Trays or watch the video below. 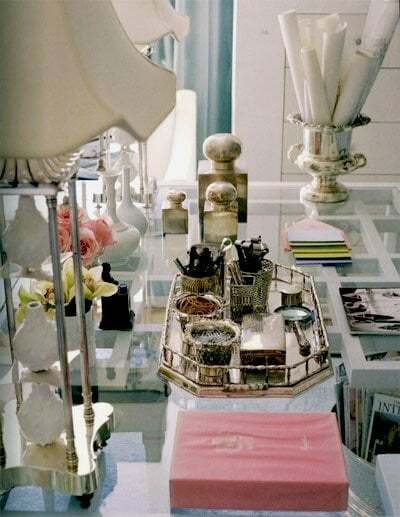 I focused mainly on silver or metal trays because they go with most color schemes and wall colors. But you can use any shape, size or color tray with great results. Of course, these are just a few ideas on how to decorate using trays - so if you've got those clunky serving trays - don't discard them - use them to decorate and conquer! Please leave a comment - I'd love to know your tray decorating stories, remember to share and join our free email list where you get things like our DIY Cheat Sheet and 42 Interior Design Secrets.